I was going through some reading material as any good stadium geek does occasionally, when I came upon one of my favorite chapters in Sports, Jobs & Taxes, the Roger Noll and Andrew Zimbalist book that set the tone for future stadium discussions along with Neil deMause’s Field of Schemes. I then remembered that I wrote a post about this years ago. And then I noticed something else while I was rereading the chapter: a flowchart. 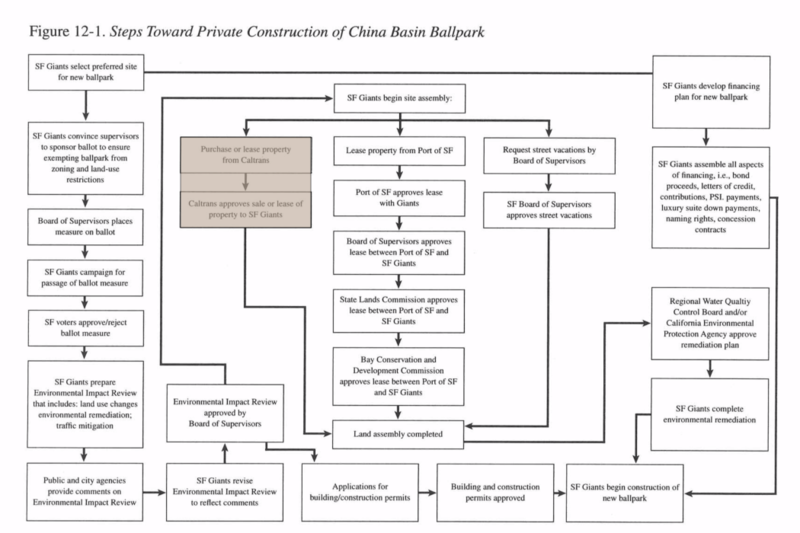 Back in 2012, I made parallels between the process China Basin went through and Victory Court, one of the last great ballpark concepts that went nowhere. I was amazed at how, 20+ years after the Giants navigated the political process and broke ground, how similar the process looks for Howard Terminal. While AB 734 sits on the governor’s desk waiting for his signature, the only procedural change it makes for the A’s is limiting the length of CEQA-related lawsuits to 270 days. So I’m presenting the flowchart again, to show you the path Howard Terminal must take to breaking ground. There are some differences, mainly the lack of Caltrans involvement in the land deal and the fact that Oakland doesn’t have a Board of Supervisors like the City and County of San Francisco (Oakland has a City Council instead), but most everything else is quite similar. The A’s and their architects apparently have a trip planned to visit several urban ballparks towards the end of the regular season. I wonder if the junket will also include a visit to the next BCDC Commission meeting. The Merc reports that the 49ers have withheld more than $5 million in rent from the City of Santa Clara. The team is due a rent “reset” that could eventually lower its annual payments from $24.5 million, a figure that includes operating costs. The 49ers like to claim that it’s the highest rent in pro sports, though most leases don’t include operating costs, usually an eight-figure item on their own. Even with those costs removed, it’s still a pretty high rent payment. That doesn’t mean anyone should be sympathetic to the Yorks. Forbes had the team’s revenue and operating income for the 2014 season at $427 million and $123.7 million, respectively. That said, the system, and the very nature of these lease agreements puts teams in a negotiating advantage from jump. If a lease is about to expire, or if there’s a clause that allows for renegotiation, chances are the team is going to take advantage of it. Let history be a guide. A year ago the Raiders withheld rent as they talked 2015 lease with the Coliseum JPA. The lease ended up being for only one year. The A’s famously had a lengthy brouhaha with the GPA over shorted parking revenue that eventually spilled over into lease talks. After Oakland played hardball with the A’s, then-MLB commissioner Bud Selig pulled the move threat card and Oakland backed down. During the Chris Cohan era, the JPA sued the Warriors three times over breach of contract, ending in settlement. The Giants owned the AT&T Park structure, so their lease with SF was for land, a nominal fee. That didn’t stop the Giants from arguing over property taxes, eventually going to court over the matter. All of that happened since the turn of the millennium. In a more charitable world, teams and their incredibly wealthy owners would hold to their contracts, instead not even waiting for the ink to dry. That’s not the world we live in. So we can grouse more about certain owners we disdain as opposed to others we hold in higher regard. It doesn’t matter. This is how teams operate. Since these facilities have such huge mortgages and most of them are publicly owned, it’s the municipalities that get the worst of it. Exactly what can the cities do, anyway? Evict the teams? Cities can and should fight for what they can, but remember that in the end, they’re not supposed to be the winners. The teams are. The deck is stacked against the public. While Mark Davis drowns his sorrows with some beer and wings, pondering his next move, we should consider what else has been happening this week. After all, unless either the Chargers decide to stay in San Diego, Davis is more-or-less stuck in Oakland. He could conceivably apply to move to a vacated San Diego or San Antonio, but that require going through this rigmarole again with a much smaller payoff. So we’ll let whole football thing settle down for a few weeks. If you want to understand what Oakland is getting ready to offer the Raiders, read my post from November. That $90 million figure is no accident. Schaaf is offering the Raiders the same amount for infrastructure at the Coliseum. She’s trying not to play favorites with either team. Of course, there is the danger of spiraling costs, and Oakland is putting itself in the position to carry the debt burden all by itself, since it’s nearing a deal to buy out Alameda County. As costs rise, the question will linger over how much Schaaf is willing to support before the projects become untenable. At least her staff has acknowledged the need for an overpass at Market Street, which was a major issue for me. Frankly, I think they need two overpasses because of Market Street’s location well away from Jack London Square. If you want to get reacquainted with Howard Terminal, read my various posts about the site. The City of St. Petersburg’s City Council approved by a 5-3 vote to allow the Rays to explore other stadium sites outside the city limits. That includes all of Pinellas County (St. Pete is the county seat), and neighboring Tampa and Hillsborough County. It’s too early to tell whether this will ultimately lead to the end of the Rays’ tenure in St. Pete, but proponents are at the outset painting this as the team’s best chance to stay in the 4.3 million-strong Tampa Bay Area, which has proved poor for attendance and excellent for TV ratings. As always, the biggest issue is figuring out how to pay for it. Head over to Noah Pransky’s Shadow of the Stadium for complete coverage. Walmart announced a slew of store closures, including a store in south San Jose and the Oakland store on Hegenberger near the Coliseum. The store will close Sunday, which led @fanpledge to wonder if it could work as an A’s ballpark site. Most importantly, the In-N-Out in the northeast corner can stay intact. I’ll cover this site in greater depth later. During today’s A’s broadcast, the between-pitch conversation turned to netting and foul balls. New part-time color commentator Eric Chavez provided an anecdote from during his career. He was hitting batting practice at Boston’s Fenway Park, when a ball he hit went into the stands, hitting a child. Chavy found out that the child had subsequently needed five eye surgeries. Boston became a focal point of safety when parts of Brett Lawrie’s broken bat ended up in the third base stands, hitting a fan in the head. Tonya Carpenter suffered life threatening injuries, but was eventually released from the hospital. Another fan who was hit by a ball while in the usually glass-protected EMC Club decided to sue the Red Sox last week. The glass had been removed for renovations. Baseball is unique among all major professional sports in that it is the only sport in which the object of play (ball) routinely travels into the seating area. Most are balls hit into foul territory, with some going out in fair territory as home runs or ground rule doubles, or sometimes the occasional errant throw. For many fans, the souvenir ball is a treasure, a real achievement. For others, the foul ball is a source of potential danger. Bats present an even more perilous, albeit less frequent, hazard. These accidents and their often horrific severity have caused MLB to consider changes to ballparks to increase safety, counter to the so-called “Baseball Rule.” The Baseball Rule stipulates that stadium operators can’t be held responsible for injuries caused by stray balls or bats. Over time lawsuits have whittled away at the rule’s strength, to the point that teams have to be much more cognizant of the risk than ever before. Yet little has changed to protect fans. Right now backstop nets generally cover about sixty feet behind home plate and little else. At the Coliseum, the net is full height at the back of the notch, with additional netting angling down towards the front of the notch. The dugouts and field boxes are completely exposed. Only seats at dugout level (sunken below the field) and dugouts at new ballparks tend to be protected. Everything else is typically exposed. The threat to baseball became more pointed when Gail Payne, an A’s season ticket holder, filed a class action lawsuit against MLB over the threat to fan safety. Never mind that a winged fruit bat has more chance of reaching Payne’s seats than one of Lawrie’s maple bats, there are still plenty of safety issues that MLB has neglected for far too long. A ball coming off the bat can reach the first row behind the dugout in every ML ballpark in one second. 1,750 fans are hit every year, the vast majority in foul territory. The lawsuit asks for new protective netting to be installed from foul pole to foul pole, covering all of the front row seats in foul territory. MLB is certain to fight that as much as it can, reasserting its Rule to some extent. To do so would severely impact views for the high-paying fans next to the field. At the same time, they have to be ready for a compromise solution. One that has been discussed recently is an extension of netting to the far edge of each dugout. That should cut down on a number of injuries, though there would still be concerns about fans farther down the lines. Considering that Lawrie’s bat brought all of this to a head, it’s worth mentioning maple’s role in all of this. Maple bats have long been known for their greater power thanks to the wood being harder than ash. The downside of the maple bat is its tendency to shatter, creating wood shards that fly around like shrapnel, hitting fans and players alike. If it came down to banning maple bats or extending nets, MLB would most likely choose the latter, since the loss of maple bats could have a negative effect on offense. The increasing role of technology is also a concern, particularly the use of smartphones and tablets during the game. As I sat in the seat pictured above for the A’s-Dbacks game last weekend, I constantly reminded myself to pay more attention to the game. That was a complete failure as I routinely looked down at my Twitter app, putting the phone away only when I was eating (another type of distraction). Going to the other end of the spectrum, it wouldn’t hurt to have a glove on in case something happens. Then again, if the A’s defense is having trouble fielding balls, how much can we expect of fans? College and amateur facilities have taken the safety net a bit further than the pros have gone, covering some of their small ballparks in nets. Tony Gwynn Stadium at San Diego State University has nets that extend several feet above the railing along the front row. Is this a bad view because of the net? Other parks have a small extended railing, maybe a foot high, above the dugout. The fact is that there’s no proper standard. Factors other than safety can also come into play. The Yankees had difficulty opening the new Yankee Stadium when they had to balance the safety concern with the visual effect of the backstop net on the home plate camera during Yankees broadcasts on the YES Network. MLB has plenty of data on injuries to institute new standards at current and future ballparks. They’ll have a couple chances to effect change at their two offseason owners meetings, where the safety issue should be a hot topic. Several teams are ready to extend the nets, provided that MLB enacts new standards. The cost should be minimal, in the low five-figures per ballpark. If MLB truly cares, they’ll act quickly by extending the nets instead of creating a task force to study potential changes. Some foul balls will go away, along with the combination of danger and excitement that being exposed entails. It’s worth the sacrifice to reduce the number of injuries. P.S. – Part 2 will cover railings and their associated risk.